Capacity: 800ML. Teapot Caliber: 6.4cm. We will always here to solve them for you. It won't help the problem to be solved. Tea Cup inside Dia: 5.1cm. Unique appearance and heat resistance between -20℃ and 150℃. 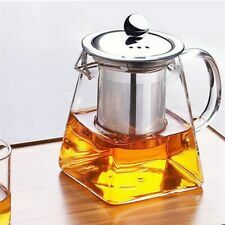 1200ml Modern Contemporary Stylish Clear Glass & Stainless Steel Teapot. Easy to use, simply place tea leaves/bags in the infuser and add boiling water. This glass teapot is stylish modern alternative to a traditional teapot. Capacity: Teapot: 550ml Cup: 375ml. Teapot: 550ml Cup: 375ml. Complete with heat resistant glass teapot, cup and strainer. Clear glass teapots are a good choice if you�re fascinated with the brewing process of the leaves and the way they unfurl releasing the flavours we enjoy. Clear Glass Infuser Teapot from Argon Tableware. Stainless Steel Infuser allows you to brew fine loose leaf tea. Bring a taste of striking, contemporary style to the traditional afternoon tea party with this Clear Glass Infuser Teapot from Argon Tableware. Easy to use, simply place tea leaves/bags in the infuser and add boiling water. 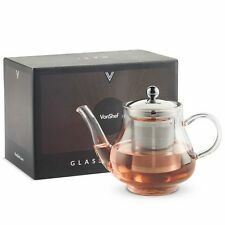 750ml Modern Contemporary Stylish Clear Glass & Stainless Steel Teapot. 750ml Capacity. This glass teapot is stylish modern alternative to a traditional teapot. Enjoy the perfect cup of tea with our range of classic Teapots from Sabichi tablewares. With stainless steel and glass finishing, this teapot is a must for all tea lovers! And we do like a nice cup of tea here at Sabichi. 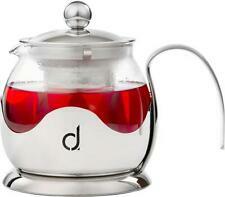 This stylish glass teapot is good for loose tea and other infusions. Heat resistant. Ideal for Catering, cafes, restaurants and coffee making at home. Prepare delicious tea and share it with your relatives and friends. Capacity: 800ML. Material: Borosilicate Glass. Teapot Caliber: 6.4cm. Tea Cup inside Dia: 5.1cm. Unique appearance and heat resistance between -20℃ and 150℃. We will always here to solve them for you. The new glass teapot heater, with tealight use. 1x insulation base（Do not include the candle）. Raw materials for the high-temperature high transparent borosilicate glass. 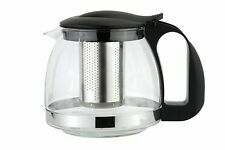 Note: handmade glass products, size, shape, weight, thickness, there are slight differences i.
Bodum Clear Glass Tea Pot/ Loose Tea Press 1litre New . Condition is New. Dispatched with Royal Mail 2nd Class. This Matcha teapot is a beautifully designed piece for flavourful and invigorating tea sessions from the Healthy Living collection by La Cafetière. Rejuvenate your senses with pure green tea or colourful fruit teas with every delicate nuance displayed through the glass. Both elegant and modern in its design, the teapot combines smooth curves with squared shaping of its handle to make this piece ideal for contemporary tea drinkers. Approx Capacity: 1000ml/35.2fl oz. Gift Boxed. Dishwasher safe. .
For the Tea Connoisseur, this gift set featuring the 'Tea Monkey emblem' includes:-. 1 x Glass vacuum Cup - 250cc. 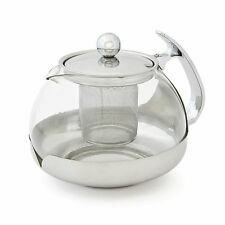 Clear Glass Infuser Teapot from Argon Tableware. Glass Infuser allows you to brew loose leaf tea - no bags required! Bring a taste of striking, contemporary style to the traditional afternoon tea party with this Clear Glass Infuser Teapot from Argon Tableware. The new glass teapot heater is suitable for two hours and four hours tea wax. Material Heat-resistant borosilicate glass. Temperature difference -20 ℃ -150 ℃. We go above and beyond to ensure you receive the best level of service. Heat Resistant pot The handle is made of ceramic and stainless steel. Other plastic components are made of nontoxic plastic. The glass bowl is made of borosilicate glass with the character of heat and cold resistance. The metal is stainless steel . Capacity: 250ml. 1 x Transparent Teapot. Transparent color design, you can easily see the inside. Color: Transparent. Made of superior glass for good durability. The products are made with glass, adopting a low-expanding coefficient technology. 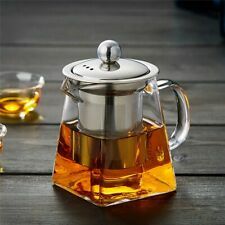 Features:Made of high-temperature high transparent borosilicate glass.Non-toxic, environmental clean and safe to use.It is suitable for two hours and four hours tea.Suitable base diameter less than the diameter of the base 9cm teapot or cup.Perfect for herbal tea, black tea, green tea, tea, fruit tea, health tea and coffee and tea series of flowers.Descriptions:The warmer bottom of teapot warmer glass keeps the tea at a perfec. Size: 600ml: Teapot 120x125mm; Cup 50ml 40x50mm; Base 122x70mm. Material: Glass. Color:Clear, Capacity:600mL. Duchess 8 cup teapot English collectable by famous Crown Dorset. Condition is New. Dispatched with Royal Mail 2nd Class.